To your visitors, Varnish is completely transparent – it only reveals its presence through “server response headers” (which can be disabled). This is because, Varnish sits in front of your web server, acting as the web server. Thus, it accepts all incoming connections/requests from the visitors’ browsers and serves the requested content and resources (i.e. images) from its cache if they exist there, without informing the user about its presence. If a page or resource is not in the cache at all or it has “expired” (see “What is TTL?” in the end of the article), then (and only then) Varnish passes the request to the origin server, and it does it transparently again. In essence, Varnish is a state of the art web accelerator. In the words of its own developers: “Its mission is to sit in front of a web server and cache content. It makes your web site go faster.” How much faster? Varnish is really fast. It can speed up content delivery with a factor of 300 – 1000x, according to its developers while serving thousands of requests per second with modest equipment. In fact, Varnish old version 2 has been measured to serve 275.000 requests per second from a single 64bit server. Accelerates the delivery of your webpages to your visitors. Reduces the amount of traffic to your web server and, in effect, minimizes both CPU usage and database access by the server. Scaling in terms of web development is the ability of a website/server to handle and serve a larger-than-its-built-for amount of requests and data. There are two common ways to scale a website: Vertical and Horizontal Scaling. In Vertical Scaling (or Scaling Up) the developer increases the resources of a single web server by adding lots of RAM GigaBytes, upgrading the CPU to the higher and most expensive possible and replacing the drives with much faster and much more expensive ones (i.e SSD) in order to be able to handle more traffic than before. Apparently, this costs a lot… Contrary to that, in Horizontal Scaling (or Scaling Out) the developer incorporates more than one much cheaper, off-the-shelf dedicated servers to the overall system. To achieve the same results in terms of speed and scalability as in Vertical Scaling, Varnish can be used in one, two or more such servers acting as proxy to “offload” traffic from the main web server and serve more content, much faster and without downtime. Since this article is more like an introduction to Varnish than a complete how-to High Availability, I will not go in depth about setting up multiple Varnish boxes (directors etc), but you can find useful references in the end of this text. Keep in mind that what follows has been tested on my server, a quad-core i7-3770 CPU @ 3.40GHz with 16GB of RAM, running Apache, Mysql and Varnish. DAEMON_OPTS="-a :80 \ -T localhost:6082 \ -f /etc/varnish/default.vcl \ -S /etc/varnish/secret \ -p thread_pool_add_delay=2 \ -p thread_pools=4 \ -p thread_pool_min=100 \ -p thread_pool_max=1000 \ -p session_linger=100 \ -p sess_workspace=262144 \ -s malloc,5G"
In this piece of code, we tell Varnish to load and run with some specific options, explained below. drop the connection if the queue is full. Instructs Varnish to “listen” to port 80. This is the default port for web access. It means: read the configuration from default.vcl (discussed below). Wait at least this long between creating new threads (default: 2ms). We need this to be both not too long and not to short, so that Varnish can create new threads fast which is essential (to avoid exhausting the queue and dropping requests) without risking threads pilling-up. Set the minimum threads in each pool to 100 (the default is 5) . We set this that high because idle threads are relatively harmless and enable Varnish to scale faster from low load situations where threads have expired. Multiply thread_pool_min by the number of thread_pools available, and you get the total threads Varnish runs on on a normal day. Use and monitor varnishstat tool to see just how many new threads your Varnish boxes actually create (check the N queued work requests n_wrk_queued). The maximum number of threads in each pool is set to 1000 (from 500). This means that we are going to have a maximum of 1000 x 4 = 4000 threads in total. Note that setting it too high will not increase performance and if you increase this number above 5000 you risk running into various issues. Furthermore, Varnish developers do not recommend running with more than 5000 threads. We instruct Varnish to keep data in memory rather than files (which is the default). As a rule of thumb you may use the following formula: (totalRAM-20%)G. If your varnish server has 16G RAM, you can safely allocate 12GB for varnish caching purposes alone. In any case, you need to monitor how the cache is behaving using varnishstat (see “monitoring Varnish” below). Watch out the n_lru_nuked variable – if it is constantly high it means your cache size is not enough for your load and Varnish is constantly nuking objects to make space. In that case, you need to increase your cache size. To see further description of these settings, run varnishadm and type in param.show -l in the Varnish management prompt. Let’s move to default.vcl. This is the file where we program the logic of our caching mechanism, instructing Varnish exactly how to behave when a request pops in, what to do with its cached resources, when to invalidate them, and so on. vlc_recv is executed when Varnish receives a new request. Thus, in vlc_recv we instruct Varnish how to respond to each new request. vcl_fetch is executed when pages/resources are fetched from the backend. Note that default.vcl already has a commented-out copy of its ‘default’ VCL logic, including all these subroutines. We will change, among others, vcl_fetch and vcl_recv, but if we did not add any code in them Varnish would execute their default logic (which is commented out but active by default). If you like you can download my working default.vcl. Below, I analyze what it does and why. In the top of default.vcl we put our default backend definition. This is where we tell Varnish where to find our web server (apache in this case). In this example, we tell Varnish that the backend server listens at 127.0.0.1 and port 8015. Yes, this is the same server Varnish runs. It is not optimal but it suffices for our little Varnish introductory how-to. In your code, just change the host and port to match your setup. 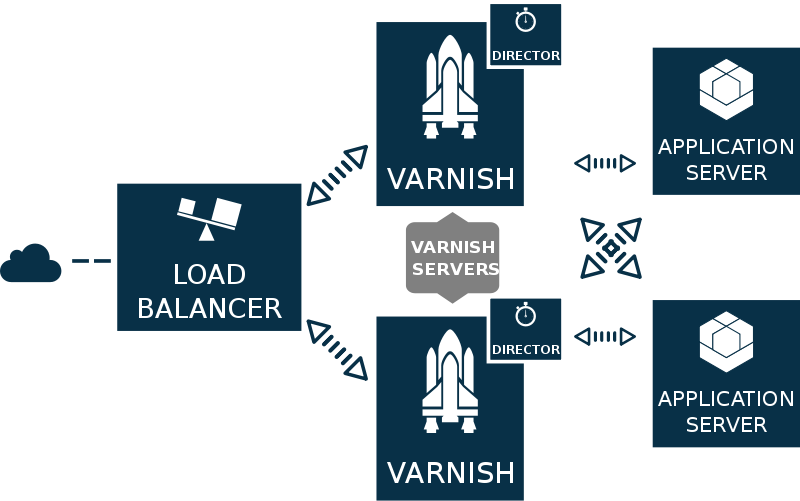 Of course, as mentioned earlier, Varnish can have several backends defined and even join several backends together into clusters for load balancing purposes. Getting back to our default backend definition, the .probe struct sets up Backend Health Polling, that is our server health polling scheme. In essence, we tell Varnish to periodically poll (make a new TCP connection to) http://127.0.0.1:8015/ to check server status. If it gets a a 200 status code, the probe is consider good. The polling period is set to 1 sec (default is 5), and probe timeout to 0.3s (that’s how long we wait for server response). If the backend server fails to answer within 0.3s, we consider the probe failed. In any case, Varnish will poll again the server at least after 1s + 0.3s. Also, we set window: 10 and threshold:8. The former defines how many of the last X polls Varnish will examine to determine backend status, while the latter sets the minimum polls in .window which must have succeeded in order to declare our server healthy. So, Varnish will poll the backend 10 times, every 1.3 sec, for a total at least of 10 secs. If 8 out of the 10 polls are good then the backend is considered healthy. Otherwise it is declared sick and… well, in that case we will instruct Varnish to enter grace mode (see below). Once you setup your backend, you can check Varnish backend sanity for yourself. We also need to have a couple of access control list (acl) definitions in our default.vcl. These are lists of hosts allowed to do certain things, i.e. purge. First, we define an ‘internal’ acl with our whole internal network subnet: 256 hosts in the 192.168.1.x range. We will allow these hosts internal access to certain files or functions which will not be accessible from the public internet. Then, we define a ‘purge’ acl. These are the hosts that will be allowed to purge/ban content from Varnish cache. Finally, we might want to define another access control list (i.e. upstream_proxy) with the upstream proxies we trust to set X-Forwarded-For correctly. This is only needed if you have a proxy in front of varnish, i.e. nginx. Note: “X-Forwarded-For” is header which we want to be populated with the original IP of our visitors, so that our backend CMS (drupal or wordpress) can see the original IP of each request. Varnish does exactly that in the default vcl_rcv routines, which will be executed after those we define ourselves below. pass (bypass the cache): Execute the rest of the Varnish processing as normal, but do not look up the content in cache or storing it to cache. pipe the request: Tells Varnish to shuffle byte between the selected backend and the connected client without looking at the content. Because Varnish no longer tries to map the content to a request, any subsequent request sent over the same keep-alive connection will also be piped, and not appear in any log. lookup the request in cache, possibly entering the data in cache if it is not already present. error – Generate a synthetic response from Varnish. Typically an error message, redirect message or response to a health check from a load balancer. Furthermore, it makes sense sometimes to force Varnish to completely disregard cookies (i.e. when requesting static files or when the backend is unhealthy) and directly serve cached content. In contrast, we often have some pages/paths that should never be cached, i.e. administrative panels or content editing tools. For them, we instruct Varnish to pass the request directly to the backend. Below you can find working code along with explanatory comments. #responding slowly or is down. # If our backend is down, unset all cookies and serve pages from cache. # client IP address. If one is already set by an upstream proxy, reuse that. # purge content from cache. # Return error 405 if the purge request comes from non-authorized IP. # Return Error 405 if client IP not allowed. # Wordpress admin and user pages. # Edit/Add paths that should never be cached according to your needs. # request directly to Apache for streaming. # Also, you should pipe the requests for very large files, i.e. downloads area. # Stop people playing around with our website. # Do not allow outside access to cron.php or install.php or server-status. # from IPs not included in 'internal' acl. # Varnish may throw error 404 directly along with a nice message. # Or if you like a custom Drupal error page you've defined at the path "404". # Varnish will always cache the following file types and serve them (during TTL). # Note that Drupal .htaccess sets max-age=1209600 (2 weeks) for static files. # functioning, you can force Varnish to cache them. # we want to remove all unnecessary cookies. But instead building a "blacklist"
# we build a "whitelist" of cookies which will not be excluded. # All other cookies will be automatically stripped from the request. # so that the user sees fresh content. # Comments inside the if statement explain what the commands do. #    previously, back. (\1) is first matching group in the regsuball. Note the commented-out return (lookup) in the end of the vcl_recv function. This is done so because when we terminate vcl_recv using one of the terminating statements (pass, pipe, lookup, error), its default logic is completely overridden. We do not want this since most of that default logic in vcl_recv is needed for a well-behaving Varnish server. A different thread has already made a request to the backend that’s not yet finished. With the above code we instructed Varnish to continue serving expired objects until they are 6 hours old (past their expiry time – TTL) when the backend is not healthy, otherwise to serve expired objects only for 15s beyond their TTL. You can set req.grace higher to ensure delivery of some, even old, content when the backend is down. Note that you need to have enabled Backend Polling (we did earlier in default.vcl’s default backend definition) – otherwise Varnish will always consider the backend healthy. This commands Varnish to keep all objects 6 hours in cache past their expiry time (TTL). In our setup, the TTL of all resources in Varnish cache is controlled by the backend which shall set a “Cache-Control: max-age” header to 10 minutes (see below the explanation of TTL and how we setup the backend to set the correct header). Thus the above line of code says that all objects will be definitely purged from cache after 10 minutes plus 6 hours. When the backend is alive and healthy, each piece of content will be cached for TTL + 30s, in our case for a total of 10′ and 30” (Cache: HIT). After that, Varnish will refresh it from the backend (Cache: MISS, and the all clients will have to wait for it to finish). When the backend is down or misbehaving, all content will stay in cache for TTL + 6h, equaling to 370 minutes in our case. After that, we better have our backend back online, or our pages will be inaccessible to visitors. High-traffic website admins should carefully select the grace duration, because it may unexpectedly impact the user experience even when the backend is healthy. For instance, as Varnish wiki states, if a page or object has 1000 requests per second then and Varnish needs 2 seconds to fetch and refresh it from the backend, then 2000 clients may wait for it. Finally note that there is no point setting beresp.grace < req.grace. Because beresp.grace is the maximum grace period of every each object, it should be set to the maximum value we ever want to set req.grace to. deliver: Delivers the object to the client. If the object is not in cache it is also stored in cache. In vcl_fetch we can use the request object, req, but also the backend response, beresp, which contains the HTTP headers from our web server. All we do in the code below is to unset cookies for requested static files and set the grace period to 6h for expired content, as discussed earlier. We could change here the default TTL, but we do not (see why in the “Setting object TTL in Varnish” section below). We only change default TTL (beresp.ttl) to 1 hour for objects with 301 Moved Permanently response code. # If you need to explicitly set default TTL, do it below. deliver Delivers the object to the client. restart Restarts the transaction and increases the restart counter. If the number of restarts is higher than max_restarts varnish emits a guru meditation error. In the code below, we check the object’s cache hits. If they are more than zero, it means the object will be served directly from cache. In this case, we set two http headers: X-Cache-Hits with the number of hits and X-Cache with a descriptive text “HIT!”. If object cache hits are zero, it means Varnish has just fetched it from the backend so we set X-Cache with the descriptive text “MISSED IT!”. # Hide headers added by Varnish. No need  people know we're using Varnish. # Nobody needs to know we run PHP and have version xyz of it. To test the setup, see “Monitoring Varnish” section below. But we haven’t finished yet! We need to setup our backend CMS (i.e. Drupal) to work with Varnish. // Drupal sets max-age &lt; 0.
which forces cache mechanisms like Varnish, to cache all static files for 2 weeks after access. After saving your settings.php, login as admin to your site and navigate to admin/config/development/performance. There you should check that “Cache pages for anonymous users” is enabled and “Expiration of cached pages” is equal to 10 minutes (whatever you set earlier in $conf[‘page_cache_maximum_age’]). If not, check your settings again before you continue with testing Varnish as discussed below. TTL in geek speak is an abbreviation for “Time-To-Live”. In the context of proxies, caches (like Varnish) and browsers, TTL is a numerical value which tells them for how long an object can be kept in and served from the cache. To put it simply TTL is the maximum age of an object (in cache). Thus, for Varnish caching to work as intended with our websites, all objects served need to have a TTL defined somehow, so that Varnish can decide whether it should serve them from its cache or it should fetch a fresh version from the web server. Note: Keep in mind that Varnish caches objects returned by the backend with specific status codes (200, 203, 300, 301, 302, 307, 410 and 404). To cache other status codes, you need to explicitly set the beresp.ttl in vcl_fetch for them. Also note that all cache mechanisms obey the directives in the Cache-Control header returned by the server (for more about Cache-Control header read this). So, when Varnish fetches an object from the backend server, it looks for the max-age parameter (or s-maxage) in Cache-Control response header and, if it is there, sets the TTL for that object to be equal to max-age. backend nor the VCL code assigns one. total flush of the cache use "ban.url ." varnishadm param.show default_ttl default_ttl 120.000000 [seconds] Default is 120 The TTL assigned to objects if neither the backend nor the VCL code assigns one. Objects already cached will not be affected by changes made until they are fetched from the backend again. To force an immediate effect at the expense of a total flush of the cache use "ban.url ." This means that once a page has been fetched from the backend, Varnish will set its TTL=600 and keep it cached for at least 10 minutes. During that time, Varnish will not request the same object from the backend, no matter how many clients ask for it it. The cached object will be considered fresh and served from Varnish (X-Cache: Hit! ), unless we explicitly purge it from cache (see below how). In fact, because we have configured Varnish grace-mode (15s or 6h, when the server is up or down respectively), Varnish will keep objects in cache for even more: 10 min + 15 seconds when the backend is up and 10 min + 6h when the backend is down. As mentioned above, directives in Cache-Control headers might be respected by browser caches as well. When a browser downloads an object with max-age:600 Cache-Control response header, it also caches it for 10 minutes. During that period, the browser will not request (or revalidate) the object from the web server. To change this, use s-maxage parameter which is like max-age but it applies only to public caches. Varnish respects Cache-Control headers and passes them to the client, but also sets another header, called Age, with the number of seconds the object have been cached. Browsers use the Age header to determine how long to cache the object locally. So in our max-age-based scenario, a browser calculates the cache duration using the formula: cache duration = max-age – Age. This might become handy in situations where we want Varnish to cache objects longer time while disallowing client-side caches. In such a case, all we have to do is to set Age header > max-age in vcl_fetch. The above tells Varnish to keep all objects in its cache for at least 6h hours (plus the grace time). The above code will set the TTL to 5 days for all products/* pages. In everyday use of Varnish, you need to monitor your cache hit ratio, the percentage of client requests in that are actually served from Varnish cache. This should be a high number, in order for Varnish to take the load off the backend (but keep in mind that “pass” in vcl_recv is not considered a cache miss). You also need to monitor crucial statistics such as how many requests/connections you are serving, how many of them end up to the backend and so on. For all these stuff, there is a very handy tool called varnishstat. In the varnishstat output, you see on top the Varnish uptime and below that the Hitrate ratio and avg lines. The three Hitrate ratio numbers (10, 100 and 1000) are the time spans in which the avg statistic applies. So in this example, we have a 0.78 or 78% hit rate int the last 1000 seconds, which is pretty good. In fact, it should be well above 0.5. Below hitrate, varnishstat displays a list of specific statistics in four columns. The first column is the actual raw value of the statistic, the second is its per second average, the third shows the per-second average since Varnish started and finally the fourth column is the statistic name and description. Notice that some statistics like n_sess or n_object do not have a per second average, since they are counters that can decrease as well and their change rate per second is not significant. client_conn & client_req: There should be a ratio close to 1:10 between connections and requests (in the example, it is not so because I have ab’ed my server). Investigate if it’s far below or far above that. client_drop: Should be zero. Counts clients Varnish had to drop due to resource shortage. backend_fail: Need to be low. These are the backend connections failures, usually 503-errors. n_object: The total number of objects in cache. n_wrk_drop: counts requests dropped because the queues were full. Should be zero, otherwise visitors were declined access to your sites! N worker threads not created: Number of threads Varnish tried to create but failed. Should be always zero! N worker threads limited: Number of threads Varnish wanted to create, but did not either because of max threads or the thread_pool_add_delay. N overflowed work requests: Requests that had to be put on the request queue. Should be fairly static after startup. N dropped work requests: Requests Varnish never responded to because the request queue was full. Should ideally never happen. N lru nuked objects: If it is constantly high it means your cache size is not enough for your load and Varnish is constantly nuking objects to make space. In that case, you need to increase your cache size. If this is zero, there’s no point to make your cache larger. n_expired: Number of objects expired, because they passed their ttl (or ttls was set to zero) and grace time too. You can graphically monitor hits/misses with another great tool, called varnishhist. 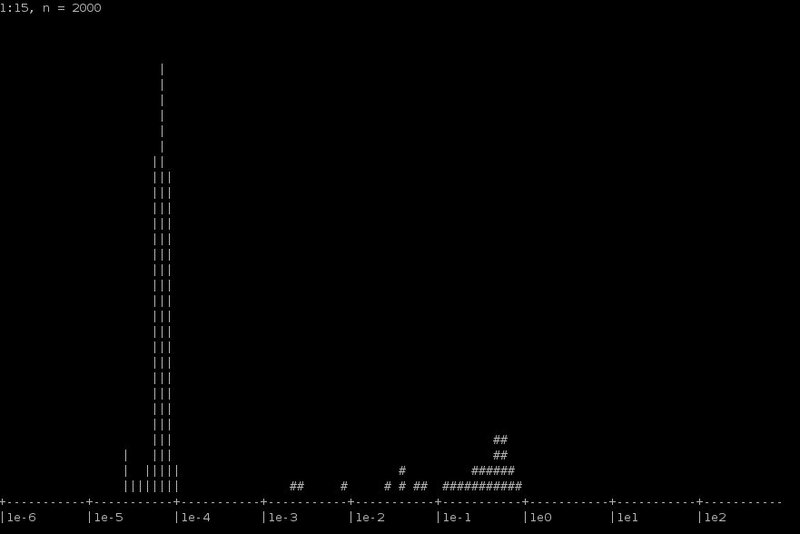 It reads varnishd shared memory logs and presents a continuously updated histogram showing the distribution of the last N requests by their processing. The value of N and the vertical scale are displayed in the top left corner. The horizontal scale is logarithmic. Hits are marked with a pipe character (“|”), and misses are marked with a hash character (“#”). which constantly prints out only the “TxURL”, the URL being retrieved from your backend, i.e. This is a nice way to find out possible setup problems in the backend CMS. If you see a domain to dominate the list, it might be that its CMS is misconfigured – or not configured at all to return max-age in its response headers, and hence Varnish does not cache it all (yes, this has happened to yours trully :))! When you want to monitor all requests for a specific URL, use varnishlog with -m parameter which takes regex and lists only the transactions that match the regex. You can have multiple -m options like in the following example. This commands lists the client requests for the frontpage of dimitris.apeiro.gr (change this to your site). You might want to monitor all requests coming from a single client/host. This is easily monitored via varnishlog. With the following command, you can monitor all communication between the client and Varnish. While the following command monitors the communication between Varnish and the backend server for requests made by the same client. Try reloading the resource in the browser. If it is cached correctly, you shouldn’t see any communication between Varnish and any backend servers. If you do see something printed there, inspect the HTTP caching headers and verify they are correct. Now make the following to test if everything is OK. First, force Varnish warm up its cache by visiting some pages. To test how Varnish is performing you can use the powefull ab tool (install apache2-utils package in Debian). But how well Varnish performs when the request has cookies also? You can check it using the curl tool. In the example below, the parameter –cookie sets our cookie, while the -I parameter tells curl to print out only response headers. varnishadm "ban req.http.host ~ www.oneirokriths13.com"
varnishadm "ban req.http.host ~ www.how-to-seo.gr &amp;&amp; req.url ~ .css"
If you can’t login to your wordpress site, after installing Varnish, this is probably a cookie problem. If you google the problem, you’ll find many threads discussing the problem with various solutions. The most usual solution offered is to add some lines to vcl_recv. The solution I came up was to stop unsetting cookies for wp-admin and wp-login urls and pass them directly to the backend (see lines 47,48 and 106 in vcl_recv code). You might also want to check out the Varnish plugin for WordPress. If you wish to exclude from Varnish caching a single domain hosted on the origin server, simply add an if test in vcl_recv function. It should look like this (change the domain to your own of course). The set req.backend = default line is optional. Google’s mod_pagespeed is a great webserver module which speeds up your sites while reduces page load times. It automagically applies some of the best web performance practices (such as compression, image/css/js minification and optimization, etags utilization etc) to all your pages and assets (js, css, images, etc) without modifying anything on your CMS/backend. It includes more than 40 configurable optimization filters, although you can see a great deal of performance improvement just by enabling it. The problem is that mod_pagespeed does not work well (not out of the box I mean) with Varnish because pagespeed optimizes all web resources (i.e. images) on the fly but not right away. So in these cases Varnish will cache and serve a partially optimized resource. The problem here is that we need a way mod_pagespeed and Varnish to talk to each other so that Varnish caches only fully optimized pages. This is done through an pagespeed.conf option called ModPagespeedBlockingRewriteKey which forces mod_pagespeed to always deliver fully optimized resources. That request-header will be send to mod_pagespeed which in turn will know that it should always deliver resources fully optimized (see explanation here). The only downside is that when you have a cold server cache, it may cost some seconds to the first visitor after the Varnish cache has expired. But you can fix this with a wget crawler (such as ‘wget YOURSITE -H X-PSA-Blocking-Rewrite:YOUR_KEY’ ) freshening periodically your cache. This is really a workaround. If you mean to seriously engage with mod_pagespeed follow the guidelines (i.e. sending a purge request to Varnish) described in the module’s Downstream Caching page. The configuration mentioned there is also addressing the issue of multiple user-agents which will fragment the cache of Varnish. Is it also possible to add a setting to this file for XenForo forum (domain.com/forum)? # request won’t go to the backend. # Remove a “;” prefix, if present. # This is now handled in vcl_recv.